Generally speaking, neither Israel nor the United States thinks very highly of international law, and it's not difficult to understand why. When you're the world's only superpower, or the Middle East's regional superpower, you believe you have the military might to impose your will by force, so you don't really look to international law to guarantee your rights. In fact, international law becomes a real irritant when you are engaged in a foreign policy based on preventative war, regime change, military occupation and colonisation. Pretending that international law doesn't exist is short-sighted for a couple of reasons. Firstly, because no nation remains powerful forever. Despite all our chest-thumping hubris, the U.S. and Israel probably reached the peak of their power in the Middle East around 1991 (immediately after the first Gulf War and the breakup of the U.S.S.R.), and are now in a gradual, potentially ugly, decline. Once their time in the sun is over, those nations that currently act with impunity might well wish that they had used their influence to strengthen international cooperation, arms control and the rule of law instead of undermining them. And secondly, just because you ignore international law doesn't mean that it goes away. You can invent as many idiosyncratic readings as you like of UNSCR 242 or the Fourth Geneva Convention, to explain away your colonization of the West Bank, your depopulation of Arab East Jerusalem, your collective punishment of the Palestinian people etc, etc. But sticking your fingers in your ears and shouting "La-la-la I can't hear you" to the demands of international law doesn't change the fact that at the end of the day the Occupied Territories are still occupied, all the settlements are still illegal, the refugees still have the right to return, and the annexation of Jerusalem is still unrecognised. Israel will never enjoy normality or international legitimacy until these core issues are acknowledged and resolved, legally. 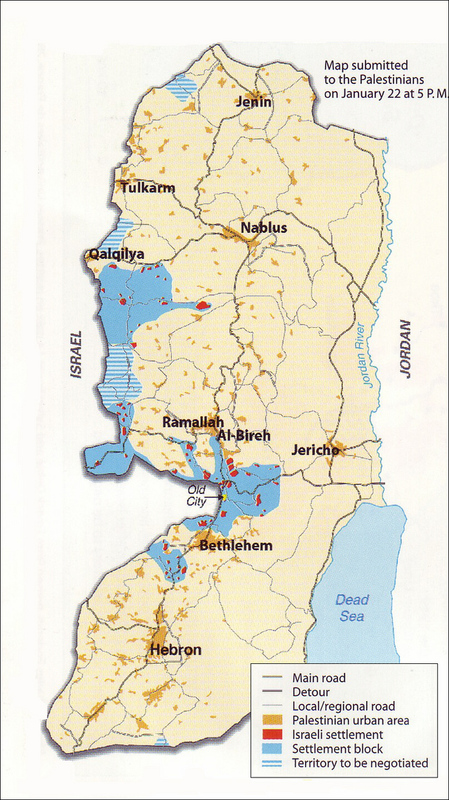 Israel's proposal for Palestinian sovereignty in the West Bank; Camp David, July 2000. (Click to enlarge). Israel's first proposal for Palestinian sovereignty in the West Bank; Taba, 22 January 2001. The Palestinian counter proposal for Palestinian sovereignty in the West Bank; Taba, 23 January 2001. NORMAN FINKELSTEIN: Well, I want to put aside for a moment the question of Hamas and just return to the previous point, namely, the relevance or not of international law. It's not an abstract question, and it's now [not?] a question fortunately only to be left to lawyers. It's a question which bears on the last third of Dr. Ben-Ami's book, namely, who is responsible for the collapse of or the impasse in the negotiations at Camp David and Taba? Whereas, in my view, when Dr. Ben-Ami wears his historian's hat, he gets everything right; when he puts on the diplomat's hat, he starts getting things, in my opinion, wrong, and it's that last third of the book where I think things go seriously awry. Now, I can't look into Mr. Arafat's heart, and I don't know what he did or didn't believe, and frankly I have no interest in it. My concern is let's look at the diplomatic record, the factual record. What were the offers being made on each side of the Camp David and in the Taba talks? And the standard interpretation, which comes — which is — you can call it the Dennis Ross interpretation, which, I think, unfortunately Dr. Ben-Ami echoes, is that Israel made huge concessions at Camp David and Taba; Palestinians refused to make any concessions, because of what Dr. Ben-Ami repeatedly calls Arafat's unyielding positions; and that Arafat missed a huge opportunity. Now, it is correct to say that if you frame everything in terms of what Israel wanted, it made huge concessions. However, if you frame things in terms of what Israel was legally entitled to under international law, then Israel made precisely and exactly zero concessions. All the concessions were made by the Palestinians. Briefly, because we don't have time, there were four key issues at Camp David and at Taba. Number one, settlements. Number two, borders. Number three, Jerusalem. Number four, refugees. Let's start with settlements. Under international law, there is no dispute, no controversy. Under Article 49 of the Fourth Geneva Convention, it's illegal for any occupying country to transfer its population to Occupied Territories. All of the settlements, all of the settlements are illegal under international law. No dispute. 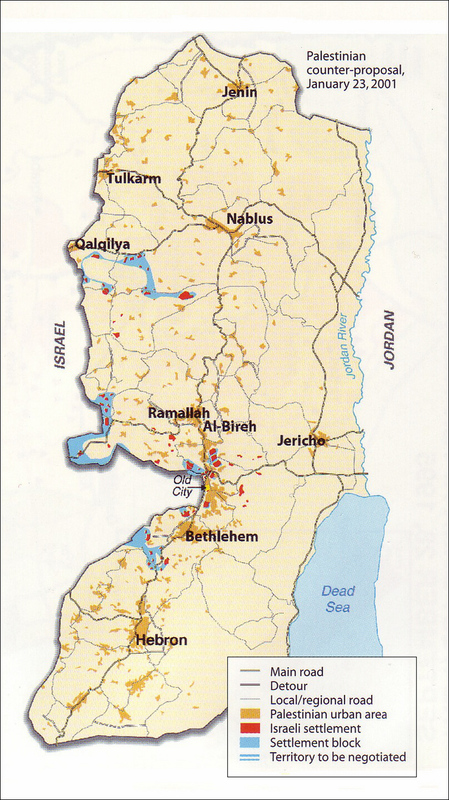 The World Court in July 2004 ruled that all the settlements are illegal. The Palestinians were willing to concede 50% — 50% of the Israeli settlements in the West Bank. That was a monumental concession, going well beyond anything that was demanded of them under international law. Borders. The principle is clear. I don't want to get into it now, because I was very glad to see that Dr. Ben-Ami quoted it three times in his book. It is inadmissible to acquire territory by war. Under international law, Israel had to withdraw from all of the West Bank and all of Gaza. As the World Court put it in July 2004, those are, quote, "occupied Palestinian territories." Now, however you want to argue over percentages, there is no question, and I know Dr. Ben-Ami won't dispute it, the Palestinians were willing to make concessions on the borders. What percentage? There's differences. But there is no question they were willing to make concessions. Jerusalem. Jerusalem is an interesting case, because if you read Dr. Ben-Ami or the standard mainstream accounts in the United States, everyone talks about the huge concessions that Barak was willing to make on Jerusalem. But under international law Israel has not one atom of sovereignty over any of Jerusalem. Read the World Court decision. The World Court decision said Jerusalem is occupied Palestinian territory. Now, the Palestinians were willing, the exact lines I'm not going to get into now — they are complicated, but I'm sure Dr. Ben-Ami will not dispute they were willing to divide Jerusalem roughly in half, the Jewish side to Israel, the Arab side to the Palestinians. And number four, refugees. On the question of refugees, it's not a dispute under international law. Remarkably, even fairly conservative human rights organizations like Amnesty International, Human Rights Watch, in 2000, during the Camp David talks, they issued statements on the question of the right of return. And they stated categorically, under international law every Palestinian, roughly five to six million, has the right to return, not to some little parcels, 1% of Israel, which Israel is about — which Israel would swap, return to their homes or the environs of their homes in Israel. That's the law. Now, Dr. Ben-Ami will surely agree that the Palestinians were not demanding and never demanded the full return of six million refugees. He gives a figure of 4-800,000. In fact — I'm not going to get into the numbers, because it's very hard to pin it down — other authors have given figures of the tens of thousands to 200,000 refugees returning. That's well short of six million. On every single issue, all the concessions came from the Palestinians. The problem is, everyone, including Dr. Ben-Ami in his book — he begins with what Israel wants and how much of its wants it's willing to give up. But that's not the relevant framework. The only relevant framework is under international law what you are entitled to, and when you use that framework it's a very, very different picture. Something to think about, next time someone tells you about Mr Barak and his Generous Offer™.